PTNA Piano License Exam is for teachers who would like to study teaching skills and theoretical knowledge in a structured manner. One of the keys to success is to learn from teachers with rich experiences. What do teachers learn from experienced teachers? 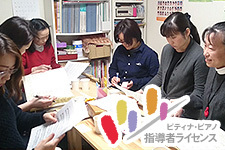 According to Yukiko Watanabe (PTNA trustee, the representative of Hibiya-Yume Station), there are a number of piano teachers who ask her for teaching pedagogical methods. They are very dedicated in teaching, but do not satisfy with their teaching skills since their students could not achieve good results in competitions or not improve fully enough. Watanabe recommends them to come to her studio with their students, and let them see her lessons to her own students in order to show effective way of teaching. Sometimes she teaches teachers directly, and that help them understand students' perspectives. She also gives them advises on time management skills if they prepare for competitions. These lessons have impact not only on students who came with their teachers, but also on other students in the same studio, and together lead them to better results in competitions. Watanabe also recommends teachers to take the PTNA Teachers' License Exam. This license exam is available for anyone who would like to learn teaching skills and pedagogical theories. Meeting and boosting exchanges at exam venues are also great incentives for examinees. She saw a lot of teachers who became confident after successful completion of all the license exams. They also had new students who had strong motivations and visions. "Piano teacher is a joyful and fruitful work to nurture students' personalities through music." says Watanabe. She raises 5 keys to be a good piano teacher. 1. Strong belief : It is very important that piano teachers have strong belief. Watanabe herself believes her students to achieve gold medals in the competition, even if s/he failed at preliminary rounds in the previous year (It actually happened). Same things can be said to piano teachers who would like to complete the teachers' license exam. Believing from the bottom of heart is the best way to pull out the potential abilities and talents of students. 2. Positive thinking : If you prejudge students' levels and predict the results as such, the result would turned out to be just as you have imagined. Students subconsciously feel how teachers judge themselves through their attitudes. This kind of judgement might degrade students' personalities. It is important to stay positive and give good images through words and attitudes toward students. 3. Patience : Have you ever been irritated when your students show no progress or improvement despite your efforts? Please do reflect yourself and consider what is missing. It is a good opportunity to improve your teaching skill by thinking how to deliver words effectively, how to make them understood, etc. Patience and continuation is a key to success in teaching. Do not see the big goal far away, but look at the issues in front of you and try to make steady progress, and that eventually helps you reach the goal. 4. Passion : Passion and strong will for achievement is indispensable. 5. Determination : Some teachers hesitate or think too much to take on a challenge, but some make quick decision. If you have strong sense of purpose, you might be able to make decision immediately. Kaoru Ogami (the representative of Nagoya Central MIRAI Station) met Yukiko Watanabe at her seminar in 2007, and immediately asked if she could teach her personally. At that time, she was not confident as a piano teacher since she did not study at music college. She was recommended to take License Exam by Watanabe, and began to took her lessons bimonthly. She learned piano performance and theoretical thinking from her, and music analysis from Tetsuya Akiyama whom Watanabe introduced. After she successfully completed all the License Exams in 2011, she became so confident with her teaching skill which is backed by solid theoretical foundation. Consequently, her students began to improve evidently and gain good results in the competition. The number of students also increased, from 15 (2007) to 56 (2018). Ogami still take lessons from Watanabe once in a three months, and works together in the Hibiya Yume Station where Watanabe takes charge. She herself established her own Station in 2015 in her local town. She learned from Watanabe that music study is a way to nurture strong personality and vitality within children through stage experiences, mental resilience, etc.